Click here to read the official PowerDVD 4.0 readme file for a brief of what's new in this release. This page tries to list all the significant new features of PowerDVD 4.0 XP - if you want to see a complete review of the latest version of PowerDVD, please refer to this page. There are now two major versions of PowerDVD for sale - Standard and Deluxe. The Standard version does not include DTS/Dolby Pro-Logic II/SRS TurSurround XT/Dolby Digital Surround EX support and all other related functions that is included in the Deluxe edition. Following WinDVD 3.0's lead in introducing DTS decoding to the PC, PowerDVD 4.0 XP has also added DTS decoding, so we can all finally hear our beloved DTS Audio CDs and DVDs. 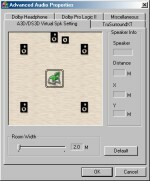 Dolby Pro-Logic II decoding has been added (Dolby Pro-Logic was added for PowerDVD 3.0), which allows you to enjoy multi-channel audio from a standard 2-channel track. The reverse is also true in that the new SRS TruSurround XT support means that multi-channel audio tracks can be outputed through 2 speakers, and the surround sound "simulated" by using audio effects (by tricking your brain into thinking the sound is coming from all sides - similar to what Dolby Headphone does with stereo headphones). Similary, this can be simulated by using the DirectSound3D or A3D, and there is a "virtual speaker" option that allows you to move the "simulated" speaker positions. Following complaints from some users about the dynamic range of DVDs and how this affects overall volume when playing back DVDs, some dynmaic range control options has been added. LFE decoding has also been added, for those which the speakers to handle it. While there does not seem to be any enhancement to the actual video decoder, some of the video related functions has been improved. The video adjustments has been improved, and now allows adjustments for a greater range of video properties (eg. contrast, colors, saturation). Users not wanting to tweak the settings too much are given ready-to-use profiles (eg. Theatre, Bright, Vivid) they can choose to suit their taste. You can also save your own profiles for later use. The video capturing functions has also been enhanced, and you are now able to capture either at the current window's size, or the size of the original video. Lastly, you can now switch on the "Screen is Always On Top" feature, which many users in the past have requested, and better support for video cards (Dual View) and monitors (proper support for widescreen monitors). There is also the new "resume play" function, which those with standalone DVD players should be familar with. Basically, "resume play" allows you to stop the DVD you are playing, perhaps even shut down the player, and the next time you insert the same disc, the player will allow you to resume to where you last left off. A manual prompt can be set to be shown everytime a "resumable" disc is inserted, or it can be automatically selected and used each and every time. One of the new interface features of PowerDVD 4.0 is it's new "minimized" skin support. What this basically means is that for the new PowerDVD 4.0 compliant skins, a "minimized" or smaller version of the skin can be used to save precious desktop space. The "minimized" skin will only have the most basic functions on it. The other noticeable new feature is the enhanced toolbar. The toolbar first made its appearance in PowerDVD 3.0, and I wasn't too thrilled about it since it did not have an auto-hide feature. Well, it seems the engineers at Cyberlink has taken note, and auto-hide is now the default option for the toolbar. The toolbar can also be customized (like any good Windows toolbar), and you can add/remove buttons as you please. The screenshots below show the tool bar with the minimum and maximum number of buttons (it has been edited somewhat to fit into this page). The "configuration" panels has also been tweaked, and only the most frequently used/basic functions are now located in plain sight, with the advanced configuration options now hidden in the advanced sections, accessible using the "advanced" button. On-screen-display has also been tweaked, and the new "show information" feature is pretty neat too. With the moniker "XP" (PowerDVD 4.0 "XP") included in the latest version of PowerDVD, of course it is fully compatible with Windows XP (new look-and-feel of Windows XP windows and dialogues are fully integrated). It is also still compatible with Windows 98, Me and 2000, with limited functionality in Windows NT.